Psalm 116 is the fourth chapter of Tehillim which we recite as part of the Hallel service on festivals; the first half of this chapter (verses 1-11) is omitted from the Hallel recitation on Rosh Hodesh and the final five days of Pesah (or the final six days in the Diaspora). This chapter, which is commonly attributed to David, is a beautiful and inspirational outburst of joy and praise to God upon being rescued from danger. 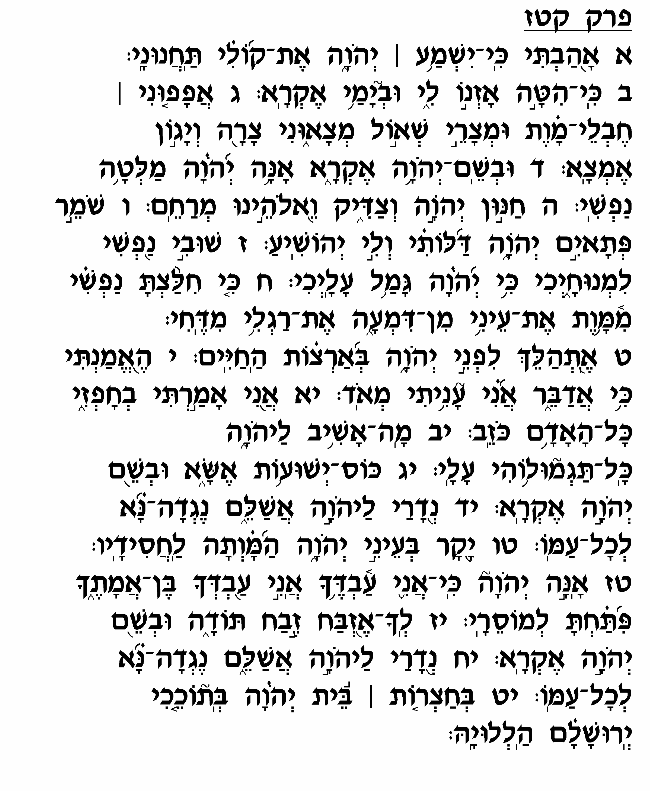 The commentators cite a Rabbinic tradition that David composed this song upon assuming the throne, after the death of King Shaul, who had spent a number of years trying to kill David. David expresses here the sense of relief he now experiences, telling his soul, as it were, that it can now rest and be at ease, thanks to the kindness that God has bestowed upon him (verse 7). He recalls finding himself on the brink of death from where he called to God for help (verses 3-4), never losing hope even during the direst of situations when everyone around him was convinced he would never survive (verses 10-11). Towards the end of this chapter, David jubilantly expresses his overwhelming desire to give thanks to the Almighty, by fulfilling the many vows he had taken during his times of trouble, and by offering a "Toda" (thanksgiving) offering in the <?xml:namespace prefix = st1 ns = "urn:schemas-microsoft-com:office:smarttags" />Temple. He further reaffirms his status as God's servant (verse 16); having witnessed and experienced God's abundant kindness and compassion, David commits himself with extra vigor and resolve to remain in God's service for his entire life. He realizes now more than ever before the inestimable value of serving God, and the special, miraculous protection that God grants His loyal and faithful servants.